I made a schoolgirl error the other day and made spag bol thinking I had hoards of this stuff in, turns out that I'd run out of it so I had to make it without it. I usually make sure I have one or two tubes of this in because it can be used for spag bol, chilli or SW pizzas which are three of my favourite SW meals. Again for purposes of spag bol and chilli and of course all day breakfasts. I buy Tesco Everyday Value because I don't think there's any difference at all between those and branded ones. If you're unsure of what this is it's just basically sieved tomatoes so it's like a thick tomato sauce without the pips. This is great for chillis, curries and even for just using as a pasta sauce. You can get a few different variations to include basil or garlic to spice things up a little if you do use it as a pasta sauce, it's roughly 40p per carton and again I don't bother buying branded because own brand is just as good (Lidl also do a nice passata). These are a brilliant alternative to fresh stuff; there's nothing I hate more than crushing garlic cloves because it's messy and it makes my hands stink! Same goes for chilli and if you happen to touch your eyes after you've worked with chilli and you forget - well let's just say I don't recommend it! 1 teaspoon of one of these is equal to 1 red chilli/clove of garlic so they're really simple to use and they last ages! For me these are an obvious addition to any store cupboard because they're brilliant for making quick, easy and cheap meals. I like to cook pasta at night and then use it the next day for lunch because it's a nice alternative to sandwiches. I would honestly feel lost without these in my cupboard at all times; they're brilliant for having with meals or on toast/jacket potatoes. An alternative to sugar which can take some getting used to if you're a real sugar addict but now I can't really tell a difference especially in things like coffee/tea and on my Weetabix. 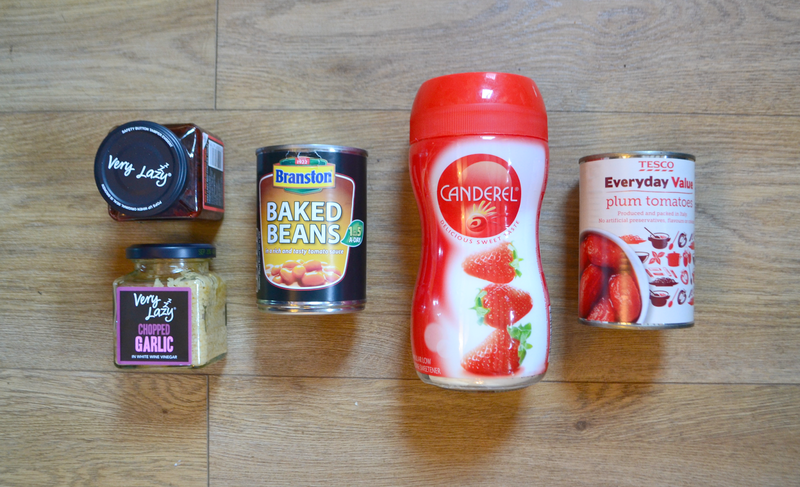 Lots of healthy baking recipes include sweetener so I always make sure I have it in jar form as well as tablets. I would think you either love or hate these packet pasta/rice things, I personally love them because they're low in fat/calories, they're quick and easy and they're pretty tasty. Rather than having a rack of loads of different herbs I just buy the pots of mixed herbs because most of the recipes I do don't need specific herbs so these are a lot cheaper and more convenient. Stock cubes and stock are a vital ingredient in lots of Slimming World recipes and they are of course a main ingredient in soups. I always make sure I have some of each (usually more beef than anything else) because they're included in so many of the recipes I make. I never ever use oil in my cooking anymore because a. I don't like the mess it makes and b. I can't tell a difference between oil and Fry Light and Fry Light has infinitely less calories! Just a couple of sprays on whatever cooking you're doing adds a bit of a lubricant and helps to brown things off, like roast potatoes, in the oven. 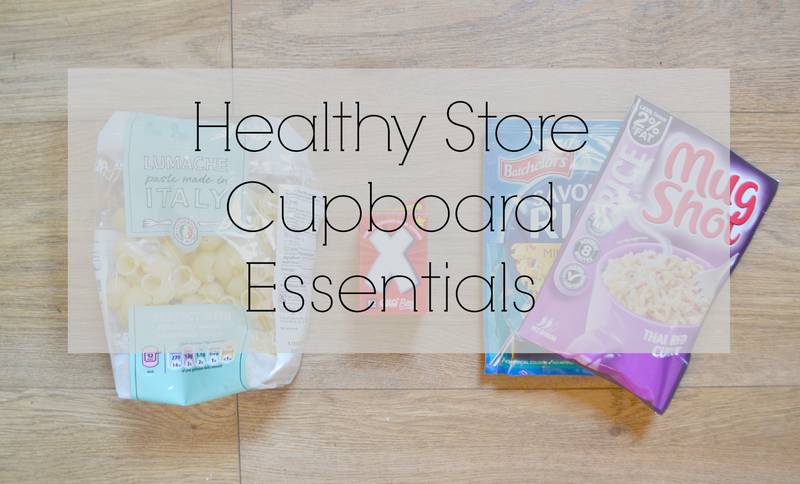 Are there any other essentials that you always keep in your cupboards?